Lovely scene for a hike. 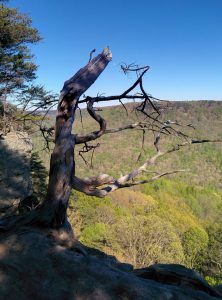 We know difficult is different for each of us depending on our abilities, but I would say this cliff would be difficult for any tree. Hope you said a prayer there. It is a beautiful place. The tree just made it more so. And any place is a good place to pray but that scene was definitely inspiring. Thanks for the comment.